UPND Katuba MP Jonas Shakafuswa today turned up at Central division headquarters for questioning but police manouvres to detain the versatile lawmaker failed as they appeared outnumbered by the huge supporters from Kabwe and surrounding central province towns. Shakafuswa was accompanied to the office of the DCIO by his lawyers Collins Chizawu of Kabesha and company, Secretary General Winston Chibwe, Central province chairman Major Roger Ziba at exactly 10:40 but the cadre cop DCIO Moola was not in the office, he was still in Lusaka getting more instructions on how to implicate Shakafuswa. Shakafuswa was questioned by Second DCIO Charles Mbita but his lawyer said he remained mute and instead police have asked him to come again on Tuesday for further questioning. Meanwhile senior police officers have told the Zambian Watchdog that police initially planned to lock up Shakafuswa under a plan dubbed operation KAT JS, Shakafuswa was supposed to report at the DCIO’s office at Divison headquarters and later be whisked through the rear door to central police station where upon he was going to be locked up and slapped with unspecified charges. Shakafuswa has described his summon as acts of intimidation and time waster, he maintains the reasons for calling him are petty and has asked PF to fulfill the campaign promises. “I am not in their cabinet, they are the ones that have annoyed the 14 million Zambians with lies let them explain. These reasons are petty but I will be back next week,” Said Shakafuswa. And Kabwe was brought to a standstill as Shakafuswa’s convoy of supporters of over 10 vehicles thronged the streets while many residents joined in the jubiliation, one resident was heard saying “kwena uyu umu lenje mwaume abapwisha ba sebana ba PF (But this Lenje speaking man is really a man and he has embarrassed and finished PF)”. 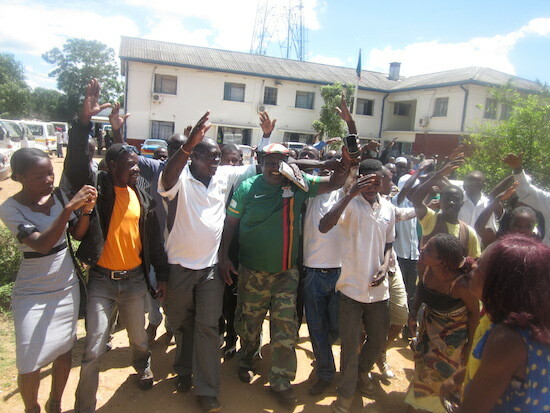 Soon after the questioning all policemen came outside and watched as UPND supporters sung songs denouncing the PF. The policemen led by their superiors looked very entertained by the proceedings.